CONCRETE SPRAY, foam and acid wash for aging make up the Irving home’s “new” façade. You might have noticed that the façade of 153 S. Irving is changing. 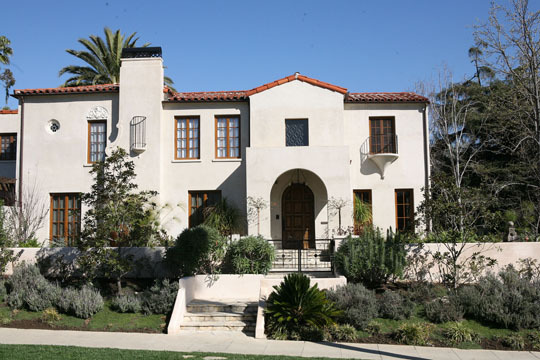 But if you were alive and living in Windsor Square 100 years ago, this “new” look would be a mirror version of the old. That’s because designer and builder Michael Tuohy of CleverTwist Design, Inc., has been slowly, painstakingly bringing the Irving house, owned by Dena Bloom and Robert Klyman, back to its original charm. “We’ve been concerned about the integrity of the home since groundbreaking, and we want to make sure we get it right,” says Tuohy. In this day and age, though, it can be difficult to find similar materials and the craftspeople required to replicate a look or style that no longer exists. 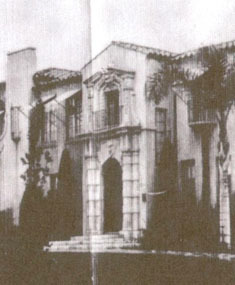 On the original home, a picture shows the decorative exterior façade was made of solid concrete. Today’s building codes do not allow for that, so Tuohy had to think outside the box. To avoid looking like Calabasas, Tuohy decided to take a different approach. Tuohy enlisted a woodcarver, fabricators and even a couple of Hollywood movie set plasterers to come up with the idea of reverse engineering the façade, using foam, a specific mix of concrete spray and an acid wash for aging. 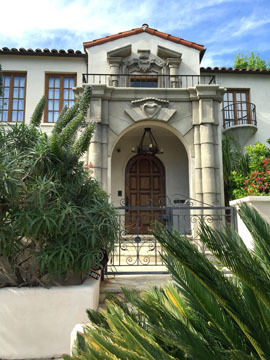 WINDSOR SQUARE home 100 years ago shows concrete decorative exterior. Using a bit of ingenuity and a lot of talent, this Windsor Square home will soon look like it did a century ago. And for those who know and love this historic neighborhood, that’s as good as it gets.